10 mins away from Incheon Intl. Airport. Good for passenger for transit! 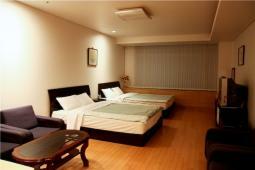 Inchon GuestHouse is 3min drive from Incheon Internaitonal Airport. All guestrooms are simply furnished with great Incheon city night view. Enjoy the beatiful ocean and mountains view. There are single,double,twin,triple and family room. Use the Free shuttle bus service to the airport.